The Sector Triplespeed is an electronic portable shape-milling machine with three distinct rotation speeds. It shapes and finely hones the edge of any type of stone or synthetic material. The onset of synthetic materials made it necessary to create an intermediate speed so as not to overheat the resin bonded components causing the material to become opaque. The shaping and polishing process is realized into a number from 5 to 7 phases, according to the kind of material. 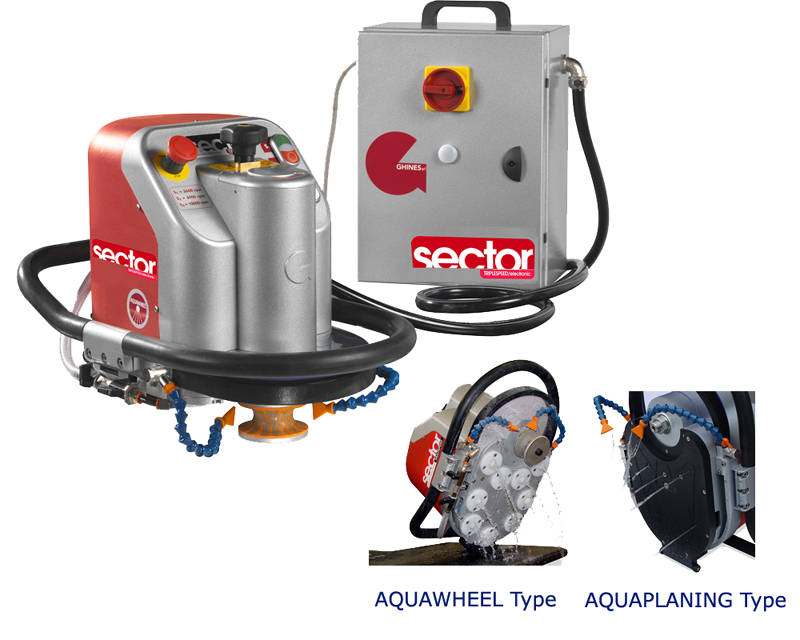 The three different tool rotation speeds can be set through the S1, S2 and S3 push buttons: Max speed (10000 rpm): Stock removal and finishing of natural materials (marble, granite) Intermediate speed (6000 rpm): Stock removal and finishing of any type of synthetic material Min. speed (2600 rpm): Polishing of both natural and synthetic materials by vulcanized GHINESTOOLS wheels High power, constant torque SECTOR TRIPLESPEED is equipped with an electronic vectorial inverter to optimize the supplied power, maintaining constant the torque at any rpm. Universal supply tension Even if equipped with a three phase motor, SECTOR TRIPLESPEED is supplied with single phase 230V/50-60Hz; therefore it can be plugged in standard single phase outlets.